RelComm Technologies Inc., established in April 1994, designs and manufactures Design Enhanced Application Specific RF Coaxial Relay Products for high volume commercial telecommunications infrastructure as well as test and measurement instrumentation operating from DC to 40 GHz. 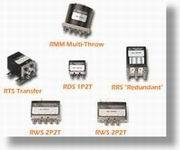 RelComm Technologies is totally focused on serving the RF Coaxial Relay product needs of the Communications and Instrumentation marketplace... these are their only products. Their focused efforts to continuously improve product performance and reduce costs through value analysis and manufacturing friendly designs allow them to provide their customers the preferred choice.